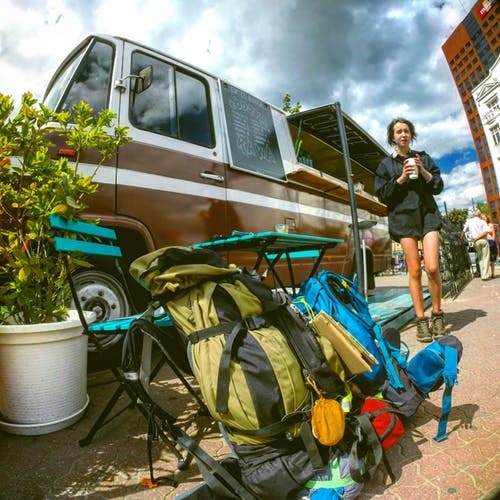 Urban stealth camping is living within an urban environment for a limited time via a tent or van. Whether permission is granted or not is solely at the discretion of the camper. If attempting to stay in a single location for an extended duration this will become squatting. If attempting urban stealth camping the art is not to allow your stay to effect others. There are a number of reasons why people will urban stealth camp. When travelling to towns and cities hotel accommodation can be expensive. Many travellers and back packers are on a budget simply wishing to pass through without expense. There are many things to do in urban environments and some stealth campers love the challenge of camping near town centres. Some wild campers do not have the ability to travel far out into the country side via car. It has to be noted that urban stealth camping falls under two main categories; tent and van. Tent camping can also be realised in hammocks, bivvys, and even under tarps. Many stealth campers g et a kick from evading detection. Highly populated places such as towns therefore are the ultimate challenge. I have seen urban stealth camping take place on roundabouts, road embankments and churchyards Van stealth campers are usually just visiting or passing through. Urban stealth camping is a rather tricky business and there is a lot to think about when planning a visit. Firstly it is essential you establish your objectives. What are you trying to achieve? If you simply wish to exercise your daring audacity be warned urban areas can be a hive of unruly behaviours at night. This is especially true on the weekend try to stay away from areas where people will be intoxicated. Are you visiting a specific place for daytime activities? Does it have good transportation links? If so your options for urban stealth camping locations increase. The best ways to formulate a plan is know what you are dealing with. Study maps and aerial photos of the areas you may wish to camp in. When you have a sketch plan visit these areas and familiarise yourself with the environment. Google maps can be very useful when studying areas from above and with their street view feature here. 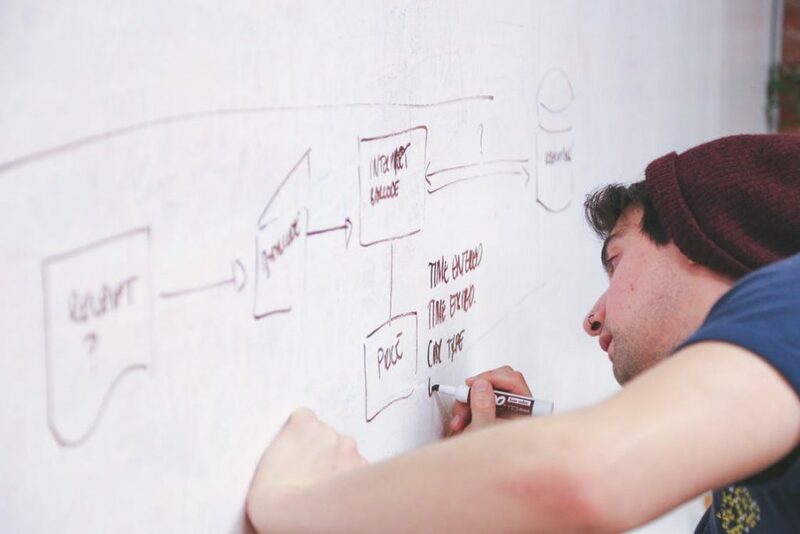 When finalising your plan it is essential to have a plan B and plan C these are best to have in place beforehand. If you are forced to move on or in danger being frightened and half asleep is not a good decision making state. Just treat it like a Special Forces operation, apply common sense and move on at first light. What equipment you will need for your urban stealth camping trip will depend on your plan. If you are stealth camping in a van you have more variety in the equipment you can bring. If on foot your equipment will have to be much more organised and light enough to carry. 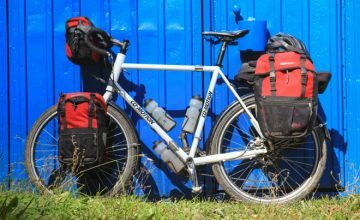 When packing your equipment it is vital to establish which bits of kit will be used most often. These should be located in easy to reach places like Bergen side pockets or belt bags. Try to pre plan each day in stages by predicting typical scenarios. These can include simple every day functions like visiting the toilet and meal planning. It may be the case that you will eat out during your stay as urban places are full of local facilities. Food taken with you should be light and easy to prepare with no smell or smoke. 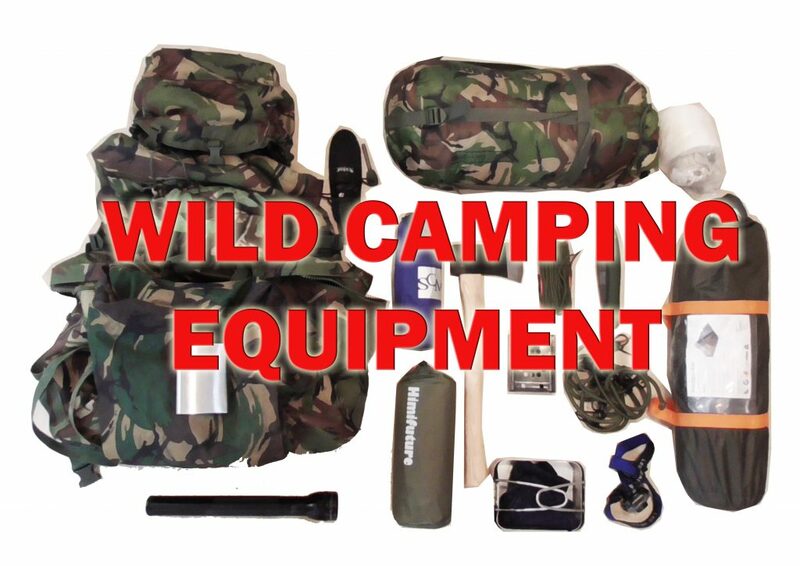 Check out our comprehensive guide to stealth & wild camping equipment here! Site selection is probably the most important part of urban stealth camping whether you are in a van or on foot. For urban stealth camping in a van you really need to focus on the parts of town you want to be closest two and work your way outwards. If you are sightseeing and want to be close to the centre obviously parking restrictions will be a common issue. Some of the best options for central locations are locating train stations out of town where parking is free. This gives you a quick and easy route in while taking the heat out of your base. The key with urban stealth camping in vans is trying to blend in. Suburbia is often good for this as people will assume a camper belongs to a family visitor. Parking outside homes will raise suspicions but placed at the road ends will be less noticed. Ultimately campers and converted vans should not look to be too isolated as this can encourage break ins. Urban stealth camping on foot provides many more options but also hazards. I personally would rather be camping around large animal predators than people. People especially in towns are unpredictable and dangerous in my opinion. This should not put you off your mission but encourage you to be very cautious in your site selection. Urban environments and even the city can have some surprisingly secret and spacious areas where nobody ever goes. 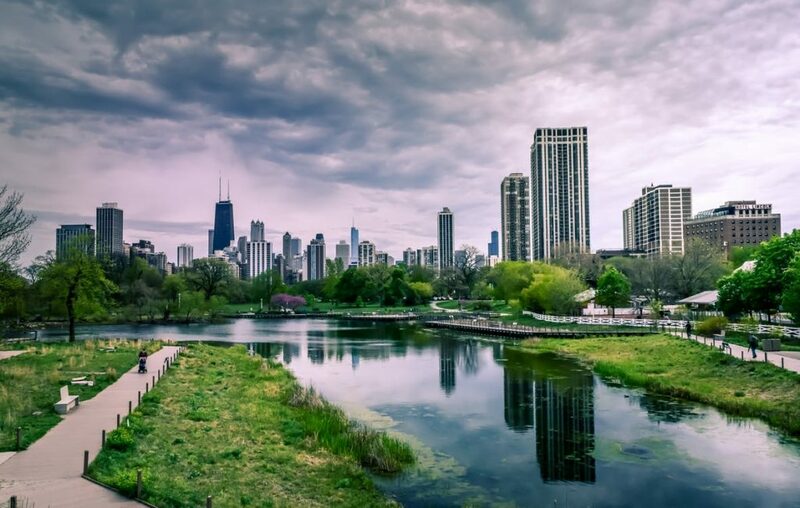 Some urban environments have more green spaces than others. If you are prepared to do some research there are places where you can remain easily hidden. The first port of call is using aerial photography to identify possible locations. The next stage is to find out what the situation is on the ground. Is there trespass signs? Is there access? Does anyone use the location? There are a few landscape types within the urban fabric which can provide these opportunities. Residential urban areas if in low density can create some great opportunities for urban stealth camping. If in a van residential suburbia provides relatively safe places to park as long as they are not directly outside peoples doorsteps. Great care should be taken not to disturb the peace of the area. It is wise to move on after a couple of nights as not to raise public attention. Urban stealth camping on foot in residential areas can be tricky. Areas of high population density usually mean hidden corners are places of antisocial behaviour. Opportunities to camp are best in low density more affluent urban zones. It has to be stressed that you should not trespass or camp on these properties. Stealth campers should aim to find safe green spaces within these areas. Public areas on the edge of watercourses and hidden thickets away from dog walkers are a possibility. Industrial areas can be extremely effective places to blend into especially if you are a van camper. It is best to avoid modern estates with vehicle recognition technology. These usually have security staff which monitors all traffic. Van campers should try to utilise industrial areas with adequate daily traffic and road side parking. These are usually well parked and lit at night making it easier to blend in. 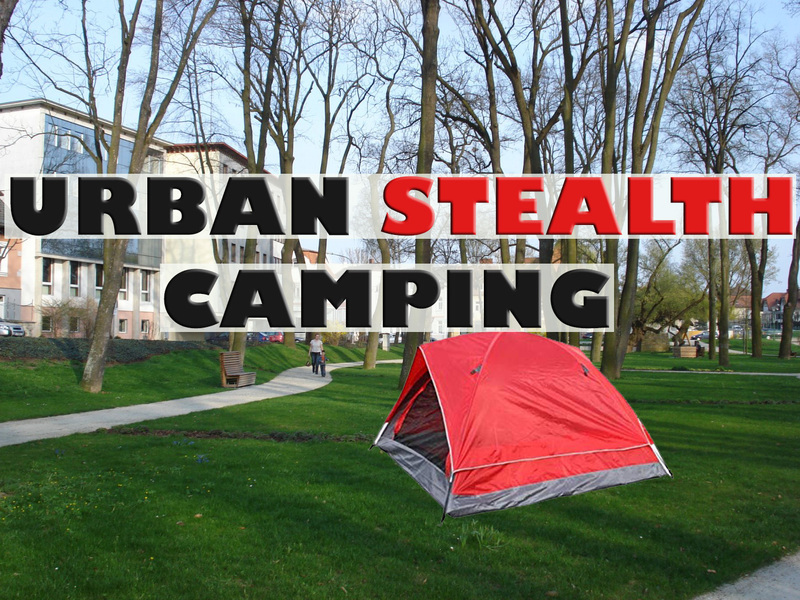 Urban stealth camping on foot in these areas can be interesting but also hazardous. I used to work as a maintenance contractor around an industrial estate in west London. I would often have to cut hedges around the edge of a well known hotel chain. One day we decided to have a walk around the waste ground at the back between blocks. We were amazed to find an area the size of two football pitches covered in dense scrub. This area could have hidden and entire football team and no one would ever know. Be warned industrial areas can be extremely dangerous and hazardous. Do your research! Guard dogs, toxic waste, asbestos and collapsing structures can be fatal in these areas. Urban centres are not the easiest of places for urban stealth camping but it is possible with planning. If you are prepared to move in and vacate early the next day urban centres can be places to stay the night. This is more possible in a van but you must be aware of local parking rules. Urban centres have a lot of CCTV and congestion charges to take into account. Success here really comes down to research and meticulous planning. If you are on foot and camping urban centres are extremely risky with a high chance you will be removed. There are probably options available in this regard but you will need to research. The truth is camping in urban centres with high populations is probably rather dangerous. 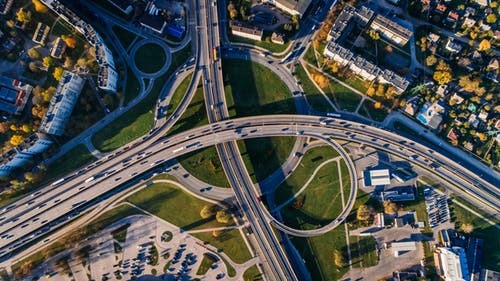 Infrastructural areas are the motorways, railways, canals, land embankments and bridges which service urban areas. Areas adjacent to these zones are the urban no man’s land of the urban fabric. Urban stealth camping locations are usually exploited on foot as there is rarely access for vehicles. These types of camping locations are controversial as they can be dangerous but effective. Many manmade corridors within the landscape provide countless opportunities to hide. There was a famous case ear me where people were living inside a dense motorway junction island. Quite simply no one expects people to go to these locations. The problem is if you get into trouble or injured in these places no one will find you. You have to weigh up all the risks when planning urban stealth camping expeditions. Accessing railways in particular is extremely dangerous and illegal. Electrical currents can jump many metres leading to instant death. Green corridors are extremely interesting places many urban residents do not even know exist. These are places where natural features within the landscape make it undesirable for development. This could be due to rivers or low land areas liable to flooding. Other factors like loose ground substrates and areas of scientific interest meant they are left green. Some live in urban areas their whole life never knowing they live next to one. An example of this is the Colne Valley to the West of London in the UK. This huge area of low lying marsh is bordered by over 2 million people! However you can walk around there all day and hardly see anyone. There are more green corridors in built up areas than people think. These can be great places to urban stealth camp and can be found by studying maps. Staying hidden or going unnoticed is a fundamental part of urban stealth camping. This is much more relevant for camping on foot with tents and hammocks. It is important to remember that in urban environments there is a fine line between camping and sleeping rough. Urban stealth camping really should aim to exploit green areas to stay hidden. This adds to the thrill of the stealthy nature of stealth camping. I would be bold and say sleeping rough in streets and alley ways is not stealth camping and rather hazardous. As described above stealth camping in vans is a much different kettle of fish to wild stealth camping. Van camping is an extremely flexible and fun way to explore new places having its own set of rules. The urban stealth van camper should aim to blend into residential areas without disturbing local people. Stealth vans can have very cool adaptions and accessories bringing in a fun DIY aspect into play. Why not check out this video of a converted van for stealth camping below plus some extra accessories. When living and eating in compact places for any amount of time hygiene can become an issue. If you are urban stealth camping to see the sights you don’t want people sniffing the air around you. Try to research possible places are to take a shower like pay as you go gyms before you leave. This is also the same for toilet facilities. Research should give you all the tools you need to have a successful and enjoyable adventure. In an urban environment there are always options when it comes to getting power. This is most important for mobile phones in case of an emergency scenario. Van campers have the advantage of cigarette light chargers in their vehicles and even petrol generators. If you are urban stealth camping on foot try to find public facilities like libraries where you charge them. If urban stealth camping on foot pick your camping spots with great caution. Urban nooks and crannies can attract some undesirable characters late at night. Try to figure out what goes on there at night before you pick a camp ground. Van drivers should try to avoid lonely locations where thieves may attempt a smash and grab theft. Also places with numerous intoxicated people on the weekends should be avoided. All urban stealth campers whether in vans or tents should aim to respect their neighbours. An element of stealth should always be maintained. Have fun but don’t make noise and don’t disturb the peace! If you do not have permission and are confronted by the law or a resident remember be apologetic and polite! People and even the police usually respond well to polite people. Just have an excuse ready! You have been kicked out by the wife or you just needed a place to stay for the night! Tell them you are sorry and move on, most of the time there will not a big problem. Thank you for reading our article on urban stealth camping! If you enjoyed reading or know someone it could benefit why not share it! This helps us to know we are doing a good job and inspires us to write more useful articles in the future. Feel free to leave comments below.